Thomas John Brokaw (/ˈbroʊkɔː/; born February 6, 1940) is an American television journalist and author, best known for being the anchor and managing editor of NBC Nightly News for 22 years (1982–2004). He is the only person to have hosted all three major NBC News programs: The Today Show, NBC Nightly News, and, briefly, Meet the Press. He now serves as a Special Correspondent for NBC News and works on documentaries for other outlets. Along with competitors Peter Jennings at ABC News and Dan Rather at CBS News, Brokaw was one of the "Big Three" news anchors in the U.S. during the 1980s, 1990s and early 2000s. The three hosted their networks' flagship nightly news programs for over 20 years, and all three started and retired (or died, in Jennings' case) within a year of each other. Brokaw has also written several books on American history and society in the 20th century. He is the author of The Greatest Generation (1998) and other books and the recipient of numerous awards and honors. Brokaw was born in Webster, South Dakota, the son of Eugenia "Jean" (née Conley; 1917–2011), who worked in sales and as a post-office clerk, and Anthony Orville "Red" Brokaw (1912–1982). He was the eldest of their three sons (Dan and Richard) and named for his maternal great-grandfather, Thomas Conley. His father was a descendant of Huguenot immigrants Bourgon and Catherine (née Le Fèvre) Broucard, and his mother was Irish-American, although the origin of the name Brokaw is contested. His paternal great-grandfather, Richard P. Brokaw, founded the town of Bristol, South Dakota, and the Brokaw House, a small hotel and the first structure in Bristol. Brokaw's father was a construction foreman for the Army Corps of Engineers. He worked at the Black Hills Ordnance Depot (BHOD) and helped construct Fort Randall Dam; his job often required the family to resettle throughout South Dakota during Brokaw's early childhood. The Brokaws lived for short periods in Bristol, Igloo (the small residential community of the BHOD), and Pickstown, before settling in Yankton, where Brokaw attended high school. As a high school student attending Yankton Senior High School, Brokaw was governor of South Dakota American Legion Boys State, and in that capacity he accompanied then-South Dakota Governor Joe Foss to New York City for a joint appearance on a TV game show. It was to be the beginning of a long relationship with Foss, whom Brokaw would later feature in his book about World War II veterans, The Greatest Generation. Brokaw also became an Advisory Board member of the Joe Foss Institute. Brokaw matriculated at the University of Iowa in Iowa City, Iowa, but dropped out after a year as he apparently failed to keep up in his studies, in his words majoring in "beer and co-eds". He received his Bachelor of Arts in Political Science from the University of South Dakota in 1964. For several years, Brokaw mountain climbed with the "Do Boys," whose members included Yvon Chouinard and Douglas Tompkins. Brokaw's television career began at KTIV in Sioux City, Iowa followed by stints at KMTV in Omaha, Nebraska, and WSB-TV in Atlanta, In 1966, he joined NBC News, reporting from Los Angeles and anchoring the 11:00 pm news for KNBC. In 1973, NBC made Brokaw White House correspondent, covering the Watergate scandal, and anchor of the Saturday editions of Nightly News. He became host of NBC's Today Show in 1976 and remained in the job until 1981. He kept a closely guarded secret for many years, in 2017 Brokaw wrote of having been offered – and having promptly turned down – the press secretary position in the Nixon White House in 1969. While living in California before Nixon made his political comeback, Brokaw had come to know H. R. 'Bob' Haldeman (White House chief of staff and initiator of the offer) as well as Nixon's press secretary, Ron Ziegler, and others members of the White House staff. Brokaw preparing for a live broadcast in the aftermath of the 1989 Loma Prieta earthquake. On April 5, 1982, Brokaw began co-anchoring NBC Nightly News from New York with Roger Mudd in Washington. After a year, NBC News president Reuven Frank concluded that the dual-anchor program was not working and selected Brokaw to be sole anchor. The NBC Nightly News with Tom Brokaw commenced on September 5, 1983. Among other news items, he covered the Challenger disaster, EDSA Revolution, Loma Prieta earthquake, fall of the Berlin Wall and Hurricane Andrew. Brokaw scored a major coup when, on November 9, 1989, he was the first English-language broadcast journalist to report opening of the Berlin Wall. Brokaw attended a televised press conference organized in East Berlin by Günter Schabowski, press spokesman for East German Politburo, which had just decided to allow East Berliners to cross to the West without prior approval. When Schabowski was asked when this epoch-making freedom would take effect, he glanced through his notes, then said, "sofort, unverzüglich" ("immediately, without delay"), touching off a stampede of East Berliners to the Wall. Brokaw subsequently obtained an interview with Schabowski who when pressed repeated his "immediately" statement. Later that evening Brokaw reported from the west side of Brandenburg Gate on this announcement and pandemonium that had broken out in East Berlin because of it. As anchor, Brokaw conducted the first one-on-one American television interviews with Soviet leader Mikhail Gorbachev and Russian President Vladimir Putin. He and Katie Couric hosted a prime-time newsmagazine, Now, that aired from 1993–94 before being folded into the multi-night Dateline NBC program. Also, in 1993, on the first broadcast of Late Show with David Letterman on CBS, in response to David Letterman's monologue containing jokes about NBC, Brokaw walked on stage in a surprise cameo (accompanied by Paul Shaffer and the CBS Orchestra playing the NBC Nightly News theme). He congratulated Letterman on his new show and wished him well, but also stated he was disappointed and shocked; he subsequently walked over to the man holding the cue cards, took two, and remarked, "These last two jokes are the intellectual property of NBC! ", leaving the stage afterwards. Letterman then remarked, "Who would have thought you would ever hear the words 'intellectual property' and 'NBC' in the same sentence?" On September 11, 2001, Brokaw joined Katie Couric and Matt Lauer around 9:30 a.m., following the live attack on the South Tower of the World Trade Center, and continued to anchor all day, until after midnight. Following the collapse of the second tower, Brokaw observed: "This is war. This is a declaration and an execution of an attack on the United States." He continued to anchor coverage to midnight on the following two days. Later that month, a letter containing anthrax was addressed to him as part of the 2001 anthrax attacks. Brokaw was not harmed, but two NBC News employees were infected. In 2008, he testified before the Commission on Prevention of Weapons of Mass Destruction Proliferation and Terrorism about the anthrax attacks, publicly discussing his experiences for the first time in a detailed, day-by-day account. Well the time is here. We've been through a lot together through dark days and nights and seasons of hope and joy. Whatever the story, I had only one objective, to get it right. When I failed, it was personally painful, and there was no greater urgency than course correction. On those occasions, I was grateful for your forbearance and always mindful that your patience and attention didn't come with a lifetime warranty. I was not alone here, of course. I am simply the most conspicuous part of a large, thoroughly dedicated and professional staff that extends from just beyond these cameras, across the country, and around the world. In too many instances, in places of grave danger and personal hardship and they're family to me. What have I learned here? More than we have time to recount this evening, but the enduring lessons through the decades are these: it's not the questions that get us in trouble, it's the answers. And just as important, no one person has all the answers. Just ask a member of the generation that I came to know well, the men and women who came of age in the Great Depression who had great personal sacrifice, saved the world during World War II and returned home to dedicate their lives to improving the nation they had already served so nobly. They weren't perfect, no generation is, but this one left a large and vital legacy of common effort to find common ground here and abroad in which to solve our most vexing problems. They did not give up their personal beliefs and greatest passions, but they never stopped learning from each other and most of all, they did not give up on the idea that we're all in this together, we still are. And it is in that spirit that I say, thanks, for all that I have learned from you. That's been my richest reward. That's Nightly News for this Wednesday night. I'm Tom Brokaw. You'll see Brian Williams here tomorrow night, and I'll see you along the way. By the end of his time as Nightly News anchor, Brokaw was regarded as the most popular news personality in the United States. Nightly News had moved into first place in the Nielsen ratings in late 1996 and held on to the spot for the remainder of Brokaw's tenure on the program, placing him ahead of ABC's Peter Jennings and World News Tonight, and CBS's Dan Rather and the CBS Evening News. 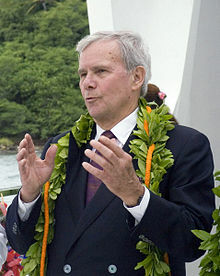 Brokaw in 2006 speaking about the attack on Pearl Harbor. Along with Jennings and Rather, Brokaw helped usher in the era of the TV news anchor as a lavishly compensated, globe-trotting star in the 1980s. The magnitude of a news event could be measured by whether Brokaw and his counterparts on the other two networks showed up on the scene. Brokaw's retirement in December 2004, followed by Rather's ouster from the CBS Evening News in March 2005, and Jennings' death in August 2005, brought that era to a close. After leaving the anchor chair, Brokaw remained at NBC as Special Correspondent, providing periodic reports for Nightly News. He served as an NBC analyst during the 2008 presidential election campaign and moderated the second presidential debate between Barack Obama and John McCain at Belmont University. He reported documentaries for the Discovery Channel and the History Channel and in 2006 delivered one of the eulogies during the state funeral of former President Gerald R. Ford. On June 13, 2008, when NBC interrupted its regular programming to announce the sudden death of NBC News Washington Bureau Chief and Meet the Press moderator Tim Russert, Brokaw served as the announcer. A week later, NBC announced that Brokaw would serve as host of Meet the Press on an interim basis. He was succeeded by David Gregory in December 2008. Brokaw serves on the board of directors of the Council on Foreign Relations, the Committee to Protect Journalists, the International Rescue Committee and the Mayo Clinic. He is also a member of the Howard University School of Communications Board of Visitors and a trustee of the University of South Dakota, the Norton Simon Museum, the American Museum of Natural History, and the International Rescue Committee. He also provides the voiceover for a University of Iowa advertisement that airs on television during Iowa Hawkeyes athletic events. In 2011 Brokaw began hosting The Boys in the Hall, a baseball documentary series for Fox Sports Net. In April 2014, a new broadcast facility opened on the Universal Studios Hollywood lot, and named in Brokaw's honor as the Brokaw News Center. The facility houses KNBC-TV, Telemundo owned-and-operated station KVEA, and the Los Angeles bureau of NBC News. In January 2019, Brokaw received criticism for comments made during an appearance on Meet the Press, saying he believed Hispanics should work harder at assimilation. Brokaw later apologized for the remarks. Since 1962, Brokaw has been married to author Meredith Lynn Auld. They have three daughters: Jennifer, Andrea, and Sarah. Brokaw and his wife spend considerable time at their ranch near Livingston, Montana, which they bought in 1989. On September 6, 2012, Brokaw was hospitalized after appearing on MSNBC's Morning Joe. He later tweeted that he was "all well" and explained his illness as having accidentally taken half a dose of Ambien in the morning. He was diagnosed with multiple myeloma in August 2013 at the Mayo Clinic. Brokaw and his physicians are "very encouraged with his progress". He has continued to work for NBC throughout his treatments. On December 21, 2014, Brokaw announced that his cancer is in full remission. In 2018, Brokaw was accused of unwanted sexual advances toward three women, one in 1968, two in the 1990s. Brokaw denied the allegations. In response to the allegations, former colleagues Rachel Maddow, Andrea Mitchell, Maria Shriver, Kelly O'Donnell, and 64 others, signed a letter characterizing Brokaw as "a man of tremendous decency and integrity". 2015 A Lucky Life Interrupted: A Memoir of Hope ISBN 978-1-4000-6969-9 (hardback) ISBN 978-0804-19500-3 (paperback). 2013 Peabody Award for enhancing his reputation since he left the NBC News desk in 2004. 2016 French Legion of Honor, for his support of World War II veterans, along with actor Tom Hanks and Gordon H. Mueller, president and co-founder of the National WWII Museum, New Orleans. ^ "Tom Brokaw – Council on Foreign Relations". Retrieved February 7, 2008. ^ "Anchor's Pay Package May Change Standards – The New York Times". The New York Times. December 20, 2001. ^ "Tom Brokaw Biography: News Anchor, Journalist (1940–)". Biography.com (A&E Networks). Retrieved June 25, 2013. ^ Brokaw, Tom. "Tom Brokaw Reflects On Cancer, 'Nightly News' And His 'Lucky Life'". NPR.org. Retrieved January 21, 2016. ^ "John Glenn College of Public Affairs | Tom Brokaw". glenn.osu.edu. Archived from the original on January 30, 2016. Retrieved January 21, 2016. ^ "Anchors could bring new era of network stability". NY Daily News. Retrieved January 21, 2016. ^ "Eugenia Conley Brokaw Obituary". ^ "Tom Brokaw Biography (1940–)". Filmreference.com. Retrieved November 27, 2011. ^ a b McGuire, John M. (November 6, 2002). "From Yankton to Yankee Town". St. Louis Post-Dispatch, p. E1. ^ "European Origins of the Brokaw - Genealogy.com". www.genealogy.com. ^ Brokaw, Tom. (2003). A Long Way from Home: Growing Up in the American Heartland in the Forties and Fifties, p. 9. New York: Random House. ^ a b Jordan, Larry (February 1995). "Tom Brokaw: A Heavyweight in a World of Lightweights Archived March 3, 2016, at the Wayback Machine". Midwest Today. ^ a b "Tom Brokaw – Biography". Yahoo! TV. Archived from the original on June 15, 2011. Retrieved August 20, 2018. ^ "Our Leadership". Joe Foss Institute. Retrieved July 21, 2014. ^ Munson, Kyle (April 10, 2017). "Tom Brokaw's 'stuff' in Iowa is a window into his life". The Des Moines Register. Retrieved March 19, 2018. ^ Roberts, Michael (December 1, 2004). "Anchor's Away". Outside. Retrieved March 19, 2018. ^ "Lions in Winter: Tom Brokaw Goes to Patagonia". Men's Journal. December 2005. Retrieved March 19, 2018. ^ Wishart, David J. (2004). Encyclopedia of the Great Plains. University of Nebraska Press. p. 507. ISBN 9780803247871. ^ Brokaw, Tom, "The Offer From Nixon I Refused" (opinion), Op-ed, The New York Times, February 17, 2017. Retrieved February 18, 2017. ^ Frank, Reuven. Out of Thin Air: The Brief Wonderful Life of Network News (New York: Simon & Schuster, 1991), pp. 383–84. ^ "Brokaw reports from the Berlin Wall". NBC NEWS. November 9, 1989. Retrieved March 20, 2016. ^ a b c Valisno, Patrick Josh (January 1, 2015). "Late Show with David Letterman First Episode (8/30/93)". Retrieved August 21, 2017 – via YouTube. ^ Owen, Rob (September 12, 2001). "Tuned In: This was reality TV at its most horrific". Post-gazette.com. Retrieved November 4, 2008. ^ emscrazy001 (November 21, 2007). "9/11/01 NBC World Trade Center Part 12". Retrieved August 21, 2017 – via YouTube. ^ "Biological Threat Assessment". C-SPAN. Retrieved August 21, 2017. ^ "CBS tops Nielsens 2nd week in row". SF Gate. March 12, 1997. ^ "Inside Cable News". Insidecable.blogsome.com. Retrieved November 4, 2008. ^ Weprin, Alex (May 25, 2011). "Fox Sports Net Orders 'The Boys in the Hall' Baseball Series, Hosted by Tom Brokaw". SportsnNwser. Media Bistro. Archived from the original on August 6, 2011. Retrieved July 4, 2011. ^ "NBC names L.A. facility for Brokaw". NewscastStudio. April 29, 2014. ^ "NBC's Tom Brokaw under fire for commentary about Hispanics". CBS News. January 28, 2019. ^ Bauder, David (January 28, 2019). "Brokaw says he feels terrible commentary offended Hispanics". AP NEWS. ^ Jackson, Dory (April 27, 2018). "Who is Tom Brokaw's wife, Meredith Auld? News anchor accused of sexual misconduct". Newsweek. Retrieved April 27, 2018. ^ Brokaw, Tom (2003). A Long Way from Home: Growing Up in the American Heartland in the Forties and Fifties. Random House Trade Paperbacks. p. Acknowledgements, x. ISBN 978-0375759352. ^ O'Keefe, Eric (May 1, 2007). "Tom Brokaw: The Land Report Interview". The Land Report. Retrieved August 21, 2017. ^ Ronnow, Karin (September 17, 2006). "'Big Sky Cooking'". Montana Standard. Retrieved August 7, 2011. ^ "UPDATE: Tom Brokaw Says He's Fine After Hospital Run". Deadline. September 6, 2012. Retrieved September 6, 2012. ^ "Tom Brokaw Diagnosed With Cancer, Prognosis Encouraging". NBC News. ^ Byers, Dylan (February 11, 2014). "NBC's Tom Brokaw diagnosed with cancer". Politico. Retrieved February 12, 2014. ^ "Tom Brokaw: NBC Nightly News Anchorman's Multiple Myeloma Cancer Is In Remission". The Inquisitr News. ^ Duke, Alan (February 11, 2014). "Tom Brokaw reveals cancer diagnosis; doctors are 'optimistic'". CNN. Retrieved February 12, 2014. ^ Winograd, David (February 11, 2014). "Tom Brokaw Reveals He Has Cancer". Time. Retrieved February 12, 2014. ^ "Two women allege Tom Brokaw acted inappropriately towards them in the 90s". The Hill. April 26, 2018. Retrieved April 26, 2018. ^ "NBC News' Tom Brokaw allegedly made several unwanted sexual advances towards women including another anchor". Fox News. April 26, 2018. Retrieved April 26, 2018. ^ Reinholz, Mary (May 1, 2018). "Tom Brokaw hit on #MeToo when I was a young reporter". The Villager. ^ Setoodeh, Elizabeth Wagmeister,Ramin (April 27, 2018). "Tom Brokaw Accused of Sexual Harassment By Former NBC Anchor (EXCLUSIVE VIDEO)". Variety. Retrieved April 27, 2018. ^ "Tom Brokaw Rips "Sensational" Accuser Claims: I Was "Ambushed and Then Perp Walked"". The Hollywood Reporter. Retrieved May 3, 2018. I am facing a long list of grievances from a former colleague who left NBC News angry that she had failed in her pursuit of stardom. She has unleashed a torrent of unsubstantiated criticism and attacks on me. ^ "Rachel Maddow, Andrea Mitchell Back Tom Brokaw in Letter Signed by 64 Insiders". The Hollywood Reporter. April 27, 2018. Retrieved April 28, 2018. ^ a b c d e f g h "Tom Brokaw - Nightly News with Brian Williams". Msnbc.msn.com. June 27, 2008. Retrieved November 4, 2008. ^ "Tom Brokaw Addresses HPU's Class of 2015". highpoint.edu. High Point University. May 9, 2015. Retrieved November 2, 2015. ^ 48th Annual Peabody Awards Archived March 4, 2016, at the Wayback Machine, May 1990. ^ "Paul White Award". Radio Television Digital News Association. Retrieved May 27, 2014. ^ 63rd Annual Peabody Awards Archived August 21, 2016, at the Wayback Machine, May 2004. ^ "Walter Cronkite Award for Excellence in Journalism". Arizona State University. January 29, 2009. Retrieved August 21, 2017. ^ "Brokaw to Vanderbilt grads: Become the next 'greatest generation'". ^ 73rd Annual Peabody Awards Archived March 4, 2016, at the Wayback Machine, May 2014. ^ "One Hundred Sixty Fourth Annual Commencement". ^ "Tom Brokaw to speak at MSU Feb. 28". Montana State University. Archived from the original on August 5, 2011. Retrieved September 4, 2011. Wikimedia Commons has media related to Tom Brokaw. Booknotes interview with Brokaw on The Greatest Generation, March 7, 1999. "Tom Brokaw collected news and commentary". The New York Times.